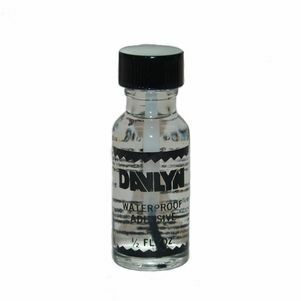 This liquid bonding adhesive is reccommended for extended wear (1-3 weeks) but NOT for daily wear. It's also waterproof so showering, swimming and tough workouts are no problem. The 1/2 oz. bottle is compact enough to carry in your pocket or purse so it's great for touch-ups and emergency situations! Directions: Brush on clear base or tape. Wait 3 minutes before positioning and press firmly into place. Allow 10 minutes more for complete contact. Removal: Use adhesive remover or solvent to release and clean adhesive residues.